THE LEGAL DUO Dean Strange and Jerome Buting, who represented Steven Avery in the murder trial of Teresa Halbach, have said they are “relieved and gratified” by the overturning of Brendan Dassey’s murder conviction. Brendan Dassey, whose case was made famous by the Netflix documentary Making a Murderer, was convicted, along with his uncle Steven Avery, of the 2005 murder of Teresa Halbach. The documentary series outlined numerous alleged flaws in the case against him and prompted demands for judicial review. Yesterday a US federal judge overturned his conviction. Speaking to The Huffington Post, Strang said Brendan’s statements, where he confessed to aiding his uncle in the murder, were involuntary. His statements were also wholly unreliable and flatly wrong on essential details, which is one of the obvious risks of coercing a statement from someone in custody. Our federal courts are often the last protectors of our liberties and justice. We are thankful and proud that a federal court fulfilled its fundamental role for Brendan Dassey today. In doing so, this federal court served all Americans. 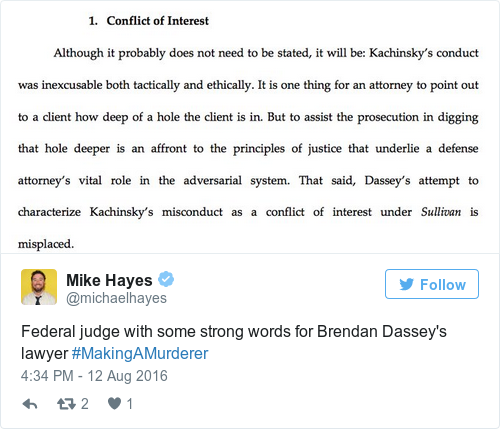 State of Wisconsin should accept federal court decision and drop case against Brendan Dassey. Avery is next. Time to go after real killer. The newspaper also reports that Avery’s former partner Jodi Stachowski has expressed fears that her former partner could be released from prison following yesterday’s ruling. Both Strang and Buting are to appear at an event in Vicar Street next month to discuss the case before an audience. Email “Strang and Buting "relieved" Brendan Dassey's conviction was overruled ”. Feedback on “Strang and Buting "relieved" Brendan Dassey's conviction was overruled ”.